In our increasingly violent times, many people are searching for ways to ensure their personal safety. While you can buy lots of modern devices to protect your home, the most reliable form of security may be the one used for thousand of years - the dog. The domesticated canine gives unconditional love to its owner. It does not discriminate between rich and poor, healthy or sick, young or old. It simply lives to please its owner. As a result, it is a natural choice and a very quick learner when asked to protect its master and home. Although there are countless names used to define the actions of a watchdog, there are really three types of protection dogs: "Alarm Dog", "Threat Dog" and "Man Stopper". Almost every dog owner already owns the first type of protection dog, the "Alarm Dog". These canines detect intruders in and around your home or car and alert you to their presence by barking. As long as it can bark, any size, shape or age of dog can perform this role. 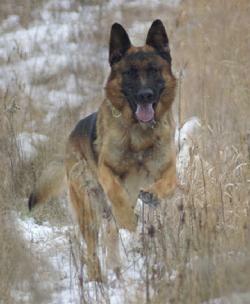 An alarm dog is a valuable deterrent to crime, and usually will scare away a would-be burglar. The disadvantage to the alarm dog is that once it has sounded the alarm, its job is finished. Anything additional that might be required to repel an intruder becomes the dog owner's responsibility. 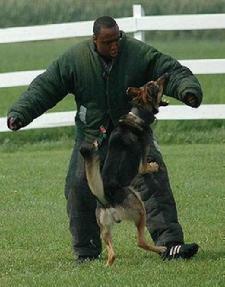 The second type of protection dog is called the "Threat Dog". Again, many dog owners already possess the beginnings of such an animal. The threat dog not only sounds the alarm, but deters crime by their mere physical presence. They show hostility when someone approaches their territory by charging the fence or front door, and give the impression a bite is in store for anyone that enters your property. The true threat dog, however, (when owned by responsible people) has been trained to bark on command AND to cease barking on command. This skill can be taught in a relatively short time, using praise while stimulating the dog's inherent drives. The owner can then turn the dog �on and off� just like a light switch! 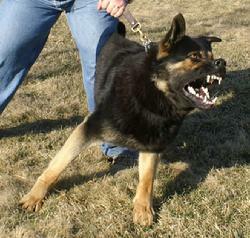 The third type of protection dog is called a "Man Stopper". This animal has been trained to apprehend and hold a person, then immediately release its hold on command from its owner or handler. 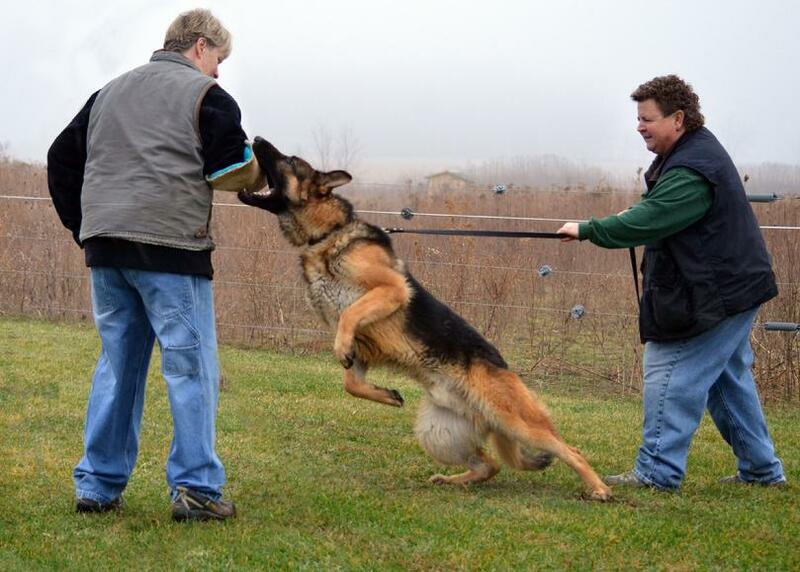 Humane man stopper training takes countless hours of positive, praising work spent building the dog's confidence and teaching control exercises. There are two distinctive types of "Man Stoppers" however, and it is a common fallacy to think that one dog can be trained to perform both functions. One form is the "Real Estate Protection Dog" who is trained to apprehend and hold any human that trespasses onto your property. This type of dog is used for guard work in well-secured commercial areas and would be extremely dangerous if kept as a family pet. It cannot differentiate between a burglar and a meter reader, an arsonist or a child retrieving its ball from your yard. The type of "Man Stopper" that is appropriate for family life is called a "personal protection dog". This dog is trained to apprehend and hold upon verbal command or signal from its owner. It is normally a friendly dog who can play with children and other friendly pets. Seventy-five percent of this training is positive obedience and control work, for the dog is only allowed to react without your command if you are physically threatened. The level of advanced obedience training these dogs possess allows them to be part of any social gathering... the beach, a family picnic, jogging at the park, or walking with you and the baby stroller! This type and style of training is extremely beneficial for those breeds of dogs with a naturally strong protective nature. 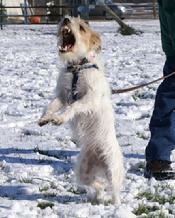 (Most herding, working and terrier breeds.) Such dogs, if left untrained, will sometimes decide on their own when you need protecting; more often than not, inappropriately! You, along with the help of a professional dog trainer, should be personally involved in the protection training of your family pet. As your dog already loves and adores you, it can be readily channeled and motivated to protect you. However, training your family pet to become a personal bodyguard requires the capabilities of a professional dog trainer who possesses the knowledge and skill to expertly develop a program to meet your individual family�s needs with your breed of dog. It is not �all about the bite�; instead it takes countless hours of proof training amongst distractions to solidly teach a dog the appropriate response to any life situation, be it horseplay amongst the kids or a real threat by an intruder. Although this training involves a great deal of your time and attention, the security and peace of mind it brings to your family is immeasurable!